In the past couple years, apps that store secure data on a Mac or iOS device have become a pretty common sight; the need for some kind of "secure vault" where you can stash everything from passwords to credit card numbers has become so prevalent, in fact, that Apple even built the ability to do so right into OS X Mavericks with iCloud Keychain. Despite that increasingly crowded marketplace, AgileBits's 1Password has managed to remain one of the most popular--and best--solutions to this particular brand of problems by providing its users with a consistently superior experience, a streak the company evidently hopes to continue with the latest release of their iOS app. The most obvious change in 1Password 4.5 is a completely redesigned user interface that brings the app in line with iOS 7's look and feel. As is often the case when software gets a fresh coat of paint to match Apple's latest design guidelines, the new interface feels lighter and cleaner than its predecessor, with lots of little details that make its use a pleasure. In particular, AgileBits's designers have managed to strike a good balance between form and function, providing a clean user interface in which all the useful capabilities are immediately available at the user's fingertips. This results in a clean, efficient, and pleasant experience, regardless of whether you're approaching the app for the first time or have been using it for a while. Even better, rather than attempting to invent a new language, the design borrows heavily from Apple's own paradigms, so that you find elements of various built-in interfaces--for example, the identity screen that looks like iOS's own contact card--interspersed throughout the app. This makes 1Password feel familiar from the outset, which, of course, translates into a more efficient user experience. Once you're a 1Password user, the built-in browser rapidly becomes your most-used app feature, since the alternative would be to painstakingly (and painfully) copy your usernames and passwords into your browser. With version 4.5, AgileBits has made a few changes to the browser, but, luckily, decided to keep it relatively simple and barebones. The main improvement here is the introduction of a "unified autofill" panel that allows you to automatically input data from your stored credentials, credit cards, or identities, thus reducing the amount of effort required to find the right bit of information for any particular task. In my brief time with the app, the browser turned out to still have a few minor kinks; for example, the "bird's eye" view, which shows screenshots of all open tabs, seems to stretch out the images a bit, and, when you close the last open tab, it takes you out of browser mode altogether and back into vault mode--rather than simply bringing you back to a blank browser window, as you would expect. Still, these are (at worst) minor annoyances and have little bearing on the browser's everyday usefulness. My only wish would be to have access to my bookmarks, which I fear Apple's sandboxing rules are preventing AgileBits from incorporating into the app. Perhaps the best feature of this version is the focus that the folks at AgileBits have demonstrated in keeping the app's functionality in check. Although I'm sure it must be tempting to choke 1Password with more and more functionality in the name of increased profits, the streamlined interface and simple look-and-feel perfectly compliment the role of an app whose job is to mostly stay out of the way and let you do your thing. Notably, the app's size has actually gone down compared to previous versions, likely as a result of the iOS 7 redesign requiring less in the way of graphics. While the difference is relatively modest (slightly less than 9MB, according to a company representative), this is exactly the kind of trend I like to see from an app that is going to call my devices home for a long time. 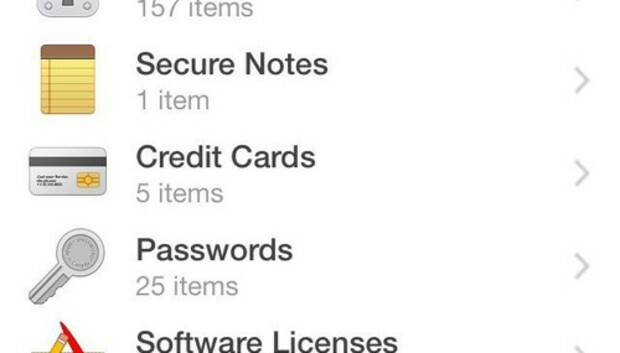 1Password 4.5, which works on both iPhone and iPads, requires iOS 7.0 or higher, and can be purchased on the App Store for $18, although AgileBits is currently offering a 50-percent discount as part of a sale.